Hello Canvas lets you preserve your most memorable photos, illustrations, and art on high quality canvas, and fit them onto a wooden frame of 1.2 inch deep! 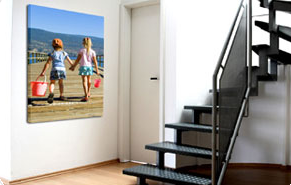 That is how we make a spectacular top quality canvas out of your greatest memories! In capturing all of my little one's special moments (really is there a moment that isn't special when it's your child?!) I have amassed thousands and thousands (seriously) of pictures that are all seemingly trapped on my SD card's. 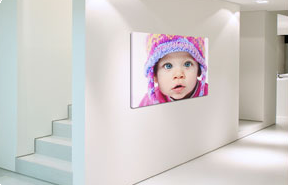 In trying to find special ways to display some of my favorite images, I came across HelloCanvas, a great company that takes your images and turns them into artwork by printing them on gorgeous canvas wraps. I have a beautiful picture of the princess, all decked out in her favorite tutu and flower headband twirling around the backyard in her bare feet last summer......without a care in the world. The reason that I fell in love with this picture was that I had snapped it while she was just doing her thing. The moment wasn't rehearsed, she wasn't prompted to smile, she was just genuinely enjoying herself doing something she love's. After uploading the photo, I was eager to see what it would look like once transferred to canvas. Within a few short days, the 24"x36" Canvas arrived (packed perfectly to withstand shipment without damage). The image is as crystal clear as it was when it was uploaded! PERFECT, and absolutely GORGEOUS, I hung it up immediately next to another fairly large image (16x20) that I have of B near my desk. Both pictures now serve to remind me of the wonderment that my children had at this age. It's something that I certainly never want to forget.....it's one of those thing's about childhood that is simply magical. Looking for the perfect way to preserve and display your favorite memories? Visit www.hellocanvas.com ! Leave a comment~Visit http://www.hellocanvas.com/ and let me know which size canvas you would like to preserve your favorite photo memory with? The comment is considered your entry. I follow on GFC and I'd buy the 20 x 20. 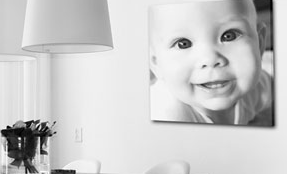 I would love to get a 16 x 20 inch canvas of a recent maternity photo!